Acanthus mollis is a rhizomatous, perennial herb. It has upright stems that grow up to 1 m long and are hairless. Leaves are borne on petioles up to 50 cm long and are about 30 cm by 50 cm, hairless, and with deeply pinnate lobes that are acutely toothed The characteristic inflorescence, which can bring the total height of the A. mollis plant up to 2 m high, has white corollas with purple veins (3.5 - 5 cm long) and appears in summer.Seeds are foremd in dry capsules although most spread appears to be vegetative (Conn 2005; Stace et al. Undated a; Williams 2008). Acanthus mollis is listed in the FDA Poisonous Plant Database (McGuffin et al. 2000; NPPA 2008). 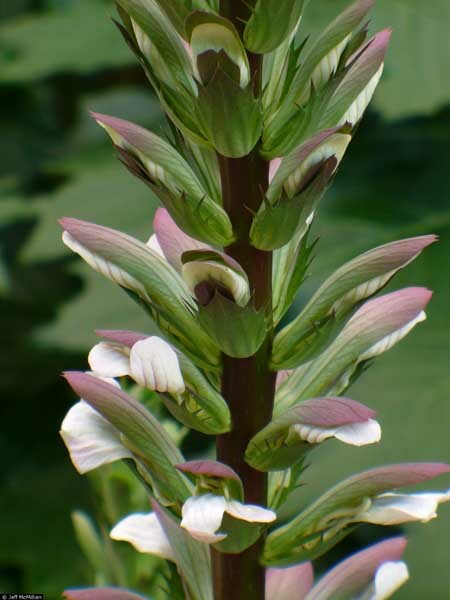 Acanthus mollis is grown as an ornamental due to its tall, striking inflorescence. A. mollis has also been used for medicinal purposes in the past (USDA-ARS 2010). Acanthus mollis can grow in a variety of soil types, including clay, and those that are dry and sandy. It prefers light to medium soil types. It can grow in partial shade or full sun; and it is cold hardy and drought tolerant. A. mollis is frequently cultivated in gardens; it can be found growing on waste land, roadsides and railway banks. A. mollis has also been found in coastal areas, disturbed areas, forests, riparian zones, scrublands and urban areas (ARPS 2007-2012; NPPA undated; Stace et al. undated a). Acanthus mollis reproduces by seed, which is spread via water currents, gravity and animals - seed setting occurs two years after germination. It can also reproduce via rhizomes, and vegetatively, via root fragments. (ARC 2008; Hosking et al. 2008; Williams 2008). Acanthus mollis plants found to be growing in places where garden waste is dumped (Hosking et al. 2007). Acanthus mollis seeds for sale online, for example in New Zealand on a internet auction/classified website, http://www.trademe.co.nz (Trade Me 2010). Recommended citation: Global Invasive Species Database (2019) Species profile: Acanthus mollis. Downloaded from http://www.iucngisd.org/gisd/species.php?sc=1663 on 21-04-2019. Acanthus mollis can form dense infestations under forest canopies, which supresses growth and regeneration of native plants species. Although found only in natural ecosystems in Australia, it is thought that A. mollis could become an agricultural pest in several states (ARPS 2007-2012; Groves et al. 2003; NPPA 2008). Preliminary management has been carried out in Australia and New Zealand. In Australia, Acanthus mollis has been noted to require control measures in three or less locations, while it has been included in a list of species requiring research as part of a pest management plan in New Zealand. (ARPS 2007-2012; Groves et al. 2003). Informations on Acanthus mollis has been recorded for the following locations. Click on the name for additional informations. Frankston City Council (FCC) undated. Frankston City Council Weed Guide. Frankston City Council, Victoria, Australia. Healy, A.J., 1958. Contributions to a Knowledge of the Adventive Flora of New Zealand, No 6. Transactions of the Royal Society of New Zealand, Vol 85, Part 4, pp 531-549, November, 1958. Horizons Regional Council (HRC) 2007. Regional Pest Plant Management Strategy. National Pest Plant Accord (NPPA) New Zealand 2008. Technical advisory group assessment of National Pest Plant Accord species. Randall R. 2007. The introduced flora of Australia and its weed status. CRC for Australian Weed Management. Department of Agriculture and Food, Western Australia. Victorian Government Department of Sustainability and Environment (DSE Vic) 2009a. Advisory list of environmental weeds of the Ranges bioregions of Victoria. Victorian Government Department of Sustainability and Environment (DSE Vic) 2009b. Advisory list of environmental weeds of the Inland Plains bioregions of Victoria. Victorian Government Department of Sustainability and Environment (DSE Vic) 2009c. Advisory list of environmental weeds ofcoastal plains and heathy forests bioregions of Victoria. Weedbusters 2009. Plant me instead! Bay of Plenty region. Yarra City Council 2009. Yarra planning scheme. Yarra, Victoria, Australia. Biondi, Daniela & Jos� Henrique Pedrosa-Macedo, 2008. Invasive plants observed in the urban area of Curitiba (Plantas Invasoras Encontradas Na Area Urbana De Curutiba, PR) FLORESTA, Curitiba, PR, v. 38, n. 1, jan./mar. 2008. Casimiro-Soriguer Solanas, Federico; Perez Latorre, Andres V., 2008. First list of alien flora for Malaga province (Spain) Acta Botanica Malacitana. 33 2008. 373-382. Conn B.J. 2005. Acanthus mollis L.. New South Wales Flora Online. Essl, F., 2008. Remarkable floristic records from Vienna, Lower Austria, Burgenland and Styria, part V. Linzer Biologische Beitraege. 40(1). JUL 2008. 341-369. Groves, R.H. (Convenor), Hosking, J.R., Batianoff, G.N., Cooke, D.A., Cowie, I.D., Johnson, R.W., Keighery, G.J., Lepschi, B.J., Mitchell, A.A., Moerkerk, M., Randall, R.P., Rozefelds, A.C., Walsh N.G., and Waterhouse, B.M. 2003. Weed categories for natural and agricultural ecosystem management. Bureau of Rural Sciences, Canberra. Summary: This document gives the status of all weed species found in Australia. Hosking, John R.; Conn, Barry J.; Lepschi, Brendan J.; Barker, Clive H., 2008. Plant species first recognised as naturalised for New South Wales in 2002 and 2003, with additional comments on species recognised as naturalised in 2000-2001. Cunninghamia. 10(1). 2007. 139-166. Howell Clayson J., John W.D. Sawyer 2006. New Zealand Naturalised Vascular Plant Checklist. New Zealand Plant Conservation Network, November 2006. Integrated Taxonomic Information System (ITIS), 2010. Acanthus mollis L.
Mahon D.J. 2007. Canterbury naturalised vascular plant checklist. New Zealand Department of Conservation. McGuffin M., Kartesz J.J., Leung A.Y., Tucker A.O. 2000. FDA Poisonous Plant Database. In: Herbs of commerce, 2nd edition. American Products Association, 421 pp. Stace C., van der Meijden R., de Kort I. undated b. Acanthus spinosus (Spiny bear s-breech). Flora of NW Europe. Trade Me - New Zealand online auctions and classifieds. 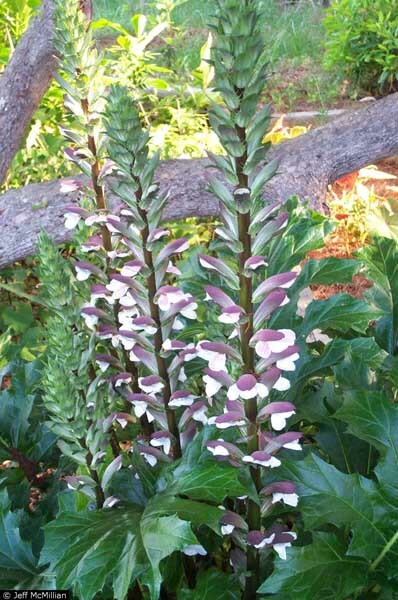 Acanthus mollis for sale, New Zealand. USDA, ARS, 2010. Taxon: Acanthus mollis L. National Genetic Resources Program. Germplasm Resources Information Network - (GRIN) [Online Database]. USDA-NRCS, 2010. Acanthus mollis L. bear s breech. The PLANTS Database (http://plants.usda.gov, 10 June 2010). National Plant Data Center, Baton Rouge, LA 70874-4490 USA.